Many people love oatmeal cookies. Eating a gluten free diet doesn't mean that you have to miss out on these delicious cookies. 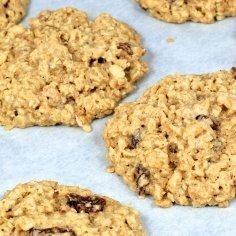 This is a guide about making gluten free oatmeal cookies. These cookies always get rave reviews so this has long been one of my favorite recipes. Also, the recipe is gluten free! I was glad to share it with my friend who has celiac disease. Combine brown sugar, shortening, and butter in pan and melt over low heat. Remove from heat; add oatmeal, soda, and salt. Add egg; mix well. Drop by teaspoons 3 inches apart (they spread a lot!) on cookie sheet topped with parchment paper. Bake at 375 degrees F. for 6 to 7 minutes. Slide parchment paper from cookie sheet and allow cookies to cool completely before removing from parchment paper. While one batch is cooking, prepare next batch on second piece of parchment paper. Reuse parchment paper for each additional batch of cookies. Makes 4 to 6 dozen of very thin and delicious cookies. Source: Some cookbook I had more than 20 years ago. Hi, Sorry to say this, but after being diagnosed with Celiac Disease years ago (Gluten Intolerance) all the doctors and dietitians have told me that oats are NOT gluten free. Most oats are grown close to wheat. So that is why it is not really considered gluten free. But oats in Canada are. I guess if you are willing to try, it is a good recipe to use. Since I am just allergic to wheat and a few other grains, I am lucky to be able to use oats. These cookies are one I will try. Thanks for the post! I have a question, is parchment paper the same as "waxed paper"? Cookies sound delicious and I would like to try them! Thanks! Editor's Note: Parchment paper is not the same as waxed paper. It is used by bakers to line cookie sheets and baking trays, to avoid sticking. It is designed to go in the oven. You can purchase it in the same section as waxed paper, plastic wrap and aluminum foil, or near cupcake liners. Oats were originally off limit for Celiac patients. Todays research indicates that it is a slightly different type of protein and 60% of people with Celiac can eat it without having any problems with villi, etc. I have been using oats for about 1 year now. I am in the 60% and recently had another biopsy done to make sure the lack of any symptoms was correct, and it was. You can get "uncontaminated" oats, ones not using machines other grains do at various sites online.